With the gradual increase in life span and in the global proportion of elderly population, importance of health and oral health care among the elderly is increasing. Xerostomia is the subjective complaint of oral dryness which may lead to the development of angular cheilitis, mucosal ulceration and leukoplakia. It also causes significant problems in denture retention. Various studies reveal an association of xerostomia with increasing age and female gender. The aim of the present study is to offer an overview on diagnosis and management of these patients. Two characteristic signs for the diagnosis of xerostomia are the “lipstick” and “tongue blade”. Current management of salivary dysfunction is directed at relieving symptoms, controlling the sequelae of hypofunction and stimulating the salivary function. Keywords: Dysphagia, Halitosis, Hyposalivation, Xerostomia. Xerostomia is a subjective sensation of dry mouth which is a common complaint among older patients during periods of anxiety, radiation therapy and immunological disorders, which lead to increased frequency of caries, candida infection, dysarthria and dysphagia. It generally arises as a side effect of treatments or medications or it can be connected to a specific disease (Table 1). Very rarely, children are born with missing salivary glands, the so-called salivary gland aplasia or agenesis. Age and medications seem to play a more important role in individuals with objective evidence of hyposalivation, while female gender and psychological factors are important in individuals with subjective oral dryness (3). Medication cause xerostomia by interfering with the transmission of signals at the parasympathetic neuro-effector junctions, interfering with actions at the adrenergic neuro-effector junctions, or causing the depression of the connections of the autonomic nervous system (Table 2). Therapeutic doses of medications do not damage salivary gland anatomy and any damage is therefore reversible with discontinued use of xerogenic drugs (1). Xerostomia is a common side effect of radiation therapy, when employed as primary, concomitant or adjuvant treatment for primary or recurrent tumors of head and neck (9). The most radiosensitive salivary gland is the parotid gland followed by submandibular, sublingual and minor salivary glands. A radiation dose as low as 20 Gy can cause permanent cessation of salivary flow if given as a single dose. At doses above 52 Gy, salivary dysfunction is severe. Diagnosis of hyposalivation is based on the patient’s history and clinical examination. Diagnosis may be facilitated by asking simple questions (7) and by performing a test i.e. “Lipstick” sign and “tongue blade” sign (11). In the “lipstick” sign, the presence of lipstick on the labial surfaces of the anterior maxillary teeth is indicative of reduced saliva that would normally wet the mucosa and aid in cleansing the teeth (2,3,12). In the “tongue blade” sign when a tongue blade is held against the buccal mucosa the tissue adheres to the tongue blade as it is lifted away in a dry mouth (2,3,12). The dental management of patients suffering from dry mouth should begin with thorough patient education and the identification of the underlying cause. Treatment should include local and systemic stimulation of salivary glands, palliative treatment for symptomatic relief, as well as preventing and treating oral complications (10). Patients with dry mouth may stop chewing and reactively modify their diet to a liquid or semi-liquid one rich in fermentable carbohydrates in order to compensate for oral dryness. Decreased mastication exacerbates the condition due to the fact that periodontal mechanoreceptors and mechanical stimulation of the oral mucosa and tongue are required stimulate salivation. Consequently, patients should be referred for nutritional counselling to educate them to minimize any negative effects from reactionary diet alterations (13). A non-specific mechanical and gustatory stimulant increases salivation; therefore, the use of sugar free gums, hard candies, and mints are highly recommended for the relief of symptoms in patients with residual salivary capacity (14). It has been found that xylitol sweetened gums prevent caries development due to limited ability of streptococcus mutants to ferment xylitol (15). The use of citric acid or candies is discouraged due to accelerating caries development (13). Lifestyle changes available to patients suffering from dry mouth to control and prevent dental caries include adhering to a rigorous oral hygiene regimen and non-cariogenic diet. Brushing twice a day with a soft bristle toothbrush and the use of a low abrasive, highly fluorinated toothpaste is recommended, accompanied by a sodium fluoride rinse (16). Current interest involves the use of fluoride varnishes to prolong the exposure to fluoride, an approach that may be beneficial to prevent xerostomia associated caries (10). Medications are available to stimulate the salivation. Prescribing parasympathetic drugs like pilocarpine has been approved for xerostomia patients. Pilocarpine is a potent and natural nonspecific cholinergic agonist which stimulates muscarinic receptor leading to the secretion of water and electrolytes, if the patients has sufficient amount of functional salivary gland tissue. Initial dose of pilocarpine should be administered 30 minutes before meals, in 5 mg tablets 3 to 4 times a day, with the usual dose range being approximately 3 to 6 tablets a day, not to exceeds two tablets per dose. Side effects seen in radiation-induced xerostomia include sweating, chills, nausea, dizziness, rhinitis and asthenia (17). Cevimeline is another cholinergic agonist used to induce salivary function. Recommended dosage for Cevimeline is 30 mg 3 times a day. It is capable of inducing salivation with minimal adverse cardiac and pulmonary effects due to the fact that Cevimeline has a high affinity for the M3 muscarinic receptor subtypes found on salivary and sweat gland (10,18). Bethanecol is reported to increase stimulated and unstimulated salivary flow rates of patients with xerostomia secondary to radiation, but objective changes in salivary flow rates did not always correlate with symptomatic improvement. It is given in a dose of 25 mg 3 times a day orally (17). When a patient complains of xerostomia and it is considered or diagnosed as a side effect of a medication, an alternative medication that does not employ the same mode of action may be prescribed. Patients are urged to coordinate the timing of the dose of necessary medications with meal times to allow sufficient salivary flow during the eating process, counteracting the drying effect of these medications; moreover, due to the fact that salivary flow is lowest during sleep, patients should avoid taking medications before bedtime (13). Patients affected with xerostomia should also increase their fluid intake due to the fact that most people do not drink enough water, contributing to the condition (13). The patients should be encouraged to place ice chips in their mouth and sip water throughout the day to provide moisture and, possibly, also relief symptoms (10). For patients with extremely low salivary flow rates, the use of saliva substitutes, based on polyacrylic acid, and xanthan gums is recommended (14); these are most effective when applied before sleeping or speaking (10). Acupuncture has been reported to increase parasympathetic activity, causing a release in neuropeptides, stimulating salivary flow and secretions. Three points are treated in each ear, and one in the radial aspect of each index finger (20). A wide range of systemic therapies has been advocated for the management of long standing xerostomia. Future treatment for some of the salivary gland disorders may require the use of gene therapy and tissue engineering (20). Sultana N, Sham E M. Xerostomia: An overview. Int J Dental Clinics 2011;3(2):58-61. Veeresha K.L, Goel R, Bansal V. Xerostomia- A common problem of the elderly. J Orofacial Health Sciences 2010;1(3):35-37. Fox PC. Differentiation of dry mouth etiology. Advances Dental Research 1996;10:13-16. Fox PC, Eversole R. Disease of salivary glands. Essentials of Oral Medicine. 2001:260-76. 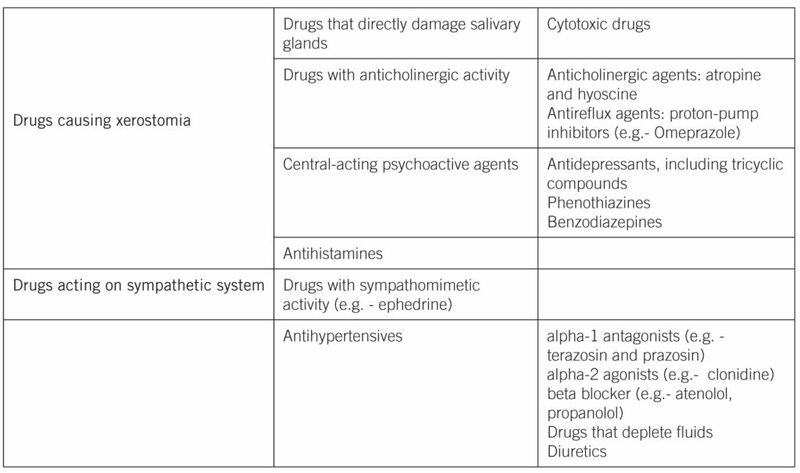 Scully C. Drug effects on salivary glands: dry mouth. Oral Diseases 2003;9(4):165-77-89. Morganstein MW. Acupuncture in the treatment of Xerostomia: Clinical report. Academy of general dentistry 2005. Gupta A, Epstein JB, Sroussi H. Hyposalivation in elderly patients. J Canadian Dental Association 2006;72(9);841-46. Turner M.D, Ship A. Dry mouth and its effects on the oral health of elderly people. J American Dental Association 2007;138. Porter S, Scully C, Hegarty A. An update of the etiology and management of xerostomia. Oral Surg Oral Med Oral Pathol Oral Radiol Endod 2004;97(1):28-46. Guggenheimer J, Moore PA. Xerostomia: etiology, recognition and treatment. J American Dental Association 2003;134(1):61-9. Shiboski CH, Hodgson TA, Ship JA, Schiodt M. Management of salivary hypofunction during and after radiotherapy. Oral Surg Oral Med Oral Pathol Oral Radiol Endod 2007;103(supplementary 1):S66-S73. Ship JA. Diagnosis, managing and preventing salivary glands disorders. Oral disease 2002;8:77-89. Diaz-Arnold AM, Marek CA. The impact of saliva on patient care: A literature review. J Prosthetic Dent 2002; 88(3):337-43. Anurag Gupta B, Epstein JB, Sroussi H. Hyposalivation in elderly patients. J Can Dent Assoc 2006; 72(9):841-6. Burt BA. The use of sorbitol-and xylitol-sweetened chewing gum in caries control. J American Dental Association 2006; 137(2):190-6. Epstein JB, van der Meij EH, Lunn R, Le ND, Stevenson-Moore P. Effects of compliance with fluoride gel application on caries and cariesrisk in patients after radiation therapy for head and neck cancer. Oral Surg Oral Med Oral Pathol Oral Radiol Endod 1996;82(3):268-75. Gorsky M, Epstein J, Parry J, MS, Le ND, Silverman S. The efficacy of pilocarpine and bethanechol upon saliva production in cancer patients with hyposalivation following radiation therapy. Oral Surg Oral Med Oral Pathol Oral Radiol Endod 2004;97:190-5. Suzuki K, Matsumoto M, Nakashima M, Takada K, Nakanishi T, Okada M et al. Effect of cevimeline on salivary components in patients with Sjögren syndrome. Pharmacology 2005; 74(2):100-5. Fox P. Systemic therapy of salivary gland hypofunction. J Dental Res 1987; 66: 689-92. Blom M, Dawidson I, Angmar-Månsson B. The effect of acupuncture on salivary flow rates in patients with xerostomia. Oral Surg Oral Med Oral Pathol 1992; 73(3):293-8. Italian Journal of Dental Medicine has chosen to apply the Creative Commons Attribution-NonCommercial 4.0 International License (CC BY-NC 4.0) to all manuscripts.